Thomas Jefferson Middle School | Hutchinson Design Group, Ltd. The Thomas Jefferson Middle School is a sprawling complex of 18 roof areas. Hutchinson Design Group was retained by Waukegan Public School District 60 Board of Education and requested to survey the roofs and make recommendations for repair and/or replacement. 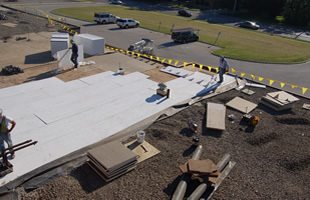 Most of the roof areas were ballasted EPDM of various ages. Inspection revealed three roof areas of concern. The others were found and determined to be aged, functional and with the potential for EPDM roof restoration, which would enhance their service lives and increase their sustainability. Additionally, only one of the three roofs designated as in need of reroofing was deemed to be in a condition that required full and complete roofing removal and replacement. The other two, while having areas of wet insulation that required removal and replacement, overall lent themselves to enhancement, where the existing ballast was reused, the existing EPDM removed, new insulation installed, roof drains renovated, roof edges raised, and new ballasted 90 mil EPDM installed, with new pre-finished metal fascia coping installed. In addition, new roof hatches and roof top ladders were installed to provide access to all roof top A.C. units, which were relocated to be adjacent drops through the roof, to now be more efficient. The remaining EPDM roofs were found to be in fair condition and with a high potential for restoration. Lap seam cover strips, 2” thick rubber walkway pads, ladder/stair access, and reflashing were all designed to enhance service life. With two crews working, the project was completed in record time and under budget. Timeliness: Project completed in the summer of 2010.